We’ve been veggie-heavy lately (check out the recent recipe posts here), but sometimes you just have to give the people what they want. My people, in the words of 3-year-old JW, “just want sammiches.” Perhaps his sammich…er… sandwich love was inherited from his father. One day, I asked Wade if I could make his favorite meal. I anticipated delicacies, seafood, or steak from a fancy restaurant or at least something labor-intensive, but he quickly said it was his mom’s ham sandwiches. 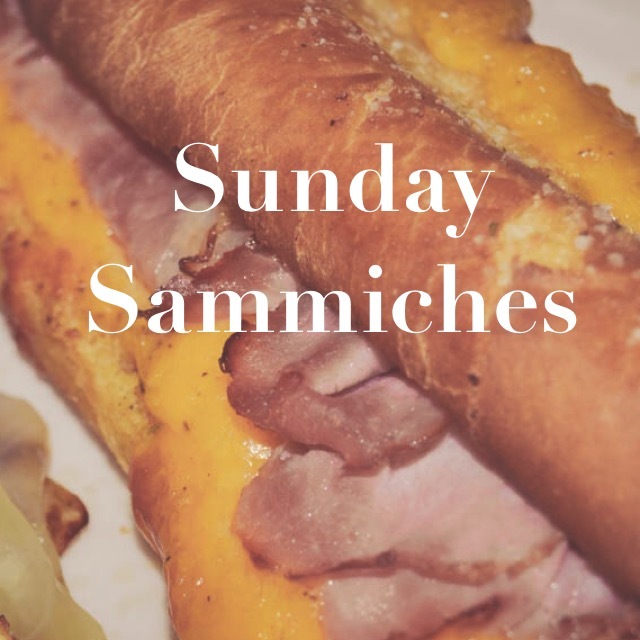 To him, these sandwiches taste like home and Sundays after church. 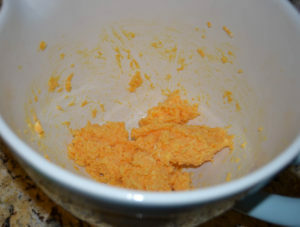 Start by combining cheese, softened butter, egg, garlic and onion powder. 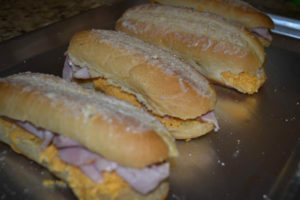 Depending on how much your group likes cheese, spread cheese mixture on 4-5 hoagie buns. We went with extra cheesy on 4 buns. Then add the shaved ham. 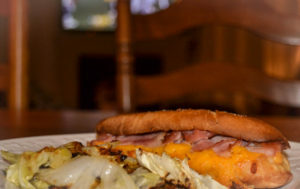 Wade’s mom always uses KY Legend ham for her sandwiches, so of course, I just had to! Generously (like genuine Southern-Sundays-kind-of-generous) spread softened butter on top of the hoagie buns, and give them a good coating of garlic salt. 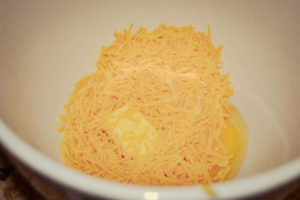 Place in a hot oven for approximately 10-12 minutes, or until cheese is melted and gooey and buns are toasted. Special note: this is man-food. Therefore, it’s best served with a side of big-screen play-off football. Go ahead… and go team! Preheat oven to 400 degrees Fahrenheit. Combine first five ingredients until mixture is spreadable. 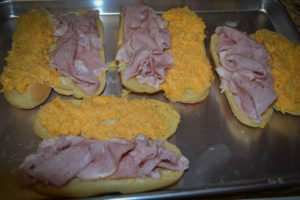 Spread mixture onto 4 or 5 hoagie bun halves. 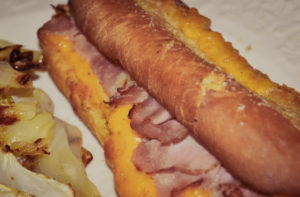 Place ham on the other half of the bun. Close up sandwiches. Generously butter tops of buns and coat with garlic salt. Bake 10-12 minutes or until cheese is good and gooey and buns are browned. Enjoy!